MA on Cape Cod. Prior sales excluded. Coupons may not be combined with any other offer. With Valpak® coupon only. Coupon void if altered. Expires 05/04/2019. & Bourne, MA on Cape Cod. With Valpak® coupon only. Coupon void if altered. Expires 05/04/2019. 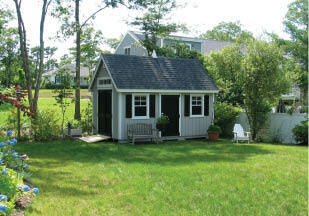 The Shed Place sells & Installs storage sheds, utility sheds, backyard bar sheds, pool houses & storage solutions of all shapes & sizes to all of Cape Cod. Need a shed in a hurry? Come in and pick one of many in stock & get it delivered quickly. 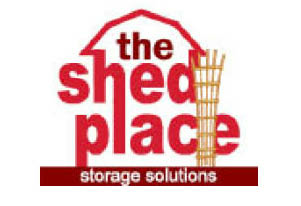 If you are not in a rush we can also build you a shed or custom shed at very competitive pricing. We also carry Adirondack chairs in many colors and styles & other outdoor yard fun for our customers such as swing sets & pirate play houses for the kids. 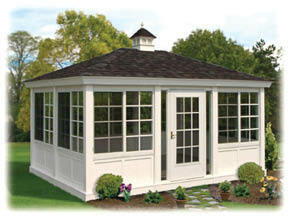 We have Garden Houses, Gazebos, Pool Houses, Garages & Backyard Storage Sheds in many colors & sizes. We serve & deliver to Cape Cod, Martha's Vineyard & the South Shore MA. area. We also have Greenhouse kits by Hoop house. We are fully Licenced & insured for your protection. Do you need a shed that looks like your house? We have 2 convenient locations, one in Bourne MA. & one in Mashpee MA. to serve you. Call, visit our website or Come in today. 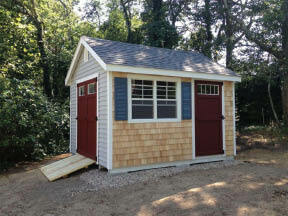 Backyard Storage Sheds, Backyard Bar Sheds, Wood Sheds, Tool Sheds, Single Story Sheds, 2 Story Sheds, Single Car Garages, 2 Car Garages, Pool Houses With Sit Down Counters, Garden Houses, Gazebos, Attractive, Handcrafted Carriage Houses , Custom Designed Sheds, Vinyl Sided Sheds, Wood Sided Sheds, Bar Sheds With Storage, Utility sheds. A-Frame, Cape, Quaker, Dutch Barn, Mini-Barn, Two Story. Detached, Single Car, Multi-Car, One Story/Two Story, Dormered. Horse Barns, Dog Kennels, Chicken Coops. Poly Furniture, Wood Furniture, Adirondack chairs. We deliver to Dukes, Barnstable, Plymouth counties & all of southeastern MA.